The 1990s saw some of the best records of Ringo’s career. In 1992, he released Time Takes Time, which The New York Times hailed as “Starr’s best: more consistently pleasing than Ringo, it shows him as an assured performer and songwriter.” Later that year, Ringo put together his second All Starr Band, featuring Zak Starkey (his son), Burton Cummings, Dave Edmunds, Nils Lofgren, Todd Rundgren, Timothy B Schmidt, and Joe Walsh. It marked the first time Ringo had toured Europe since his Beatles days. The band’s second incarnation also yielded a new concert album, Ringo Starr and His All Starr Band – Live From Montreaux. The third All Starr Band toured the U.S. and Japan in 1995, again featuring Zak Starkey, as well as John Entwistle, Felix Cavaliere, Mark Farner, Billy Preston, Mark Rivera and Randy Bachman; Ringo Starr and His Third All Starr Band, Vol. 1 was release in 1997. The fourth band — with Gary Brooker, Jack Bruce, Peter Frampton, Simon Kirke and Mark Rivera — toured the U.S. and Europe, and with them Ringo became the first former Beatle to play in Russia. Y NOT, the first album Ringo himself produced, came out in 2010, showcasing collaborations with old and new friends, Paul McCartney among them. Their duet and the album’s stunning first single, “Walk With You,” served as a moving tribute to the power of friendship. Ben Harper also sang on the album, his band supporting Ringo on a promotional tour for the release. Ringo received a star on the Hollywood Walk Of Fame and launched a tour with his 11th All Starr Band: Gregg Bissonette, Rick Derringer, Wally Palmer, Richard Page, Edgar Winter, and Gary Wright. Over the following year, the band would tour the US, Canada, Europe and Latin America. On July 7, 2010 Ringo celebrated another “Peace & Love” birthday with family, friends and thousands gathered outside the Hard Rock Café in Times Square, New York City. The following year, while on tour with All Starrs, Ringo held a “Peace & Love” birthday event outside the Hard Rock Café in Hamburg Germany. 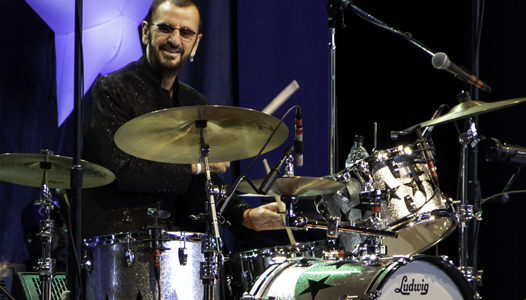 For all his many creative successes, Ringo is and always will be first and foremost a musician, a drummer. Ringo’s candor, wit and soul are the lifeblood of his music. As he sang on the autobiographical Liverpool 8, “I always followed my heart and I never missed a beat.” Peace and love are his life’s rhythm and melody, and he propels this universal message in everything he does: his evocative artwork, his enthused live performances, his legendary songs, all imbued with the joy, reflection, and wisdom of the music icon the world knows and loves simply as ‘Ringo.